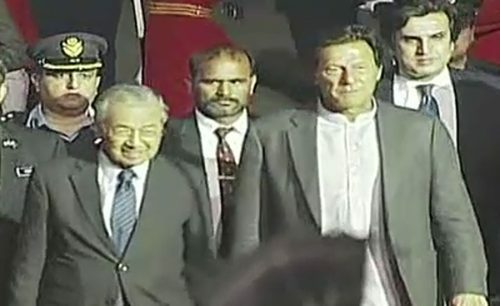 ISLAMABAD (92 News) – Malaysian Prime Minister Dr Mahathir Mohamad on Thursday arrived in Pakistan on a three-day visit. He was warmly received by Prime Minister Imran Khan at the Nur Khan airbase in Islamabad. Foreign Minister Shah Mehmood Qureshi and Minister in Waiting Makhdum Khusro Bakhtya were also present along with the Prime Minister. A twenty one gun salute was given to the distinguished guest. Two children presented a bouquet of flowers to the visiting Prime Minister. It is worth mentioning here that Dr Mahathir Mohammad is seventh Prime Minister of Malaysia who changed the course of Malaysia and transformed it into a modern and prospering country. He will be accompanied by a 35-member high-level delegation including several leading businessmen. He is paying the visit on the invitation of Prime Minister Imran Khan. Prime Minister Mahathir’s bilateral engagements also include call on President Arif Alvi, one-on-one meeting with Prime Minister Imran Khan followed by the delegation level talks. The two prime ministers will also speak at the round table meeting of the CEOs of Industries, who desire to invest in automobile and telecommunication sectors of Pakistan. During his stay, several MoUs will be signed between both countries. Foreign Office Spokesperson Dr. Muhammad Faisal, in a statement, said that the visit of Malaysian prime minister will further cement the existing brotherly and friendly relations between the two countries. He said that the focus of the interest is on enhancing economic, trade, investment, and defence ties, for the mutual benefit of the peoples of the two countries.